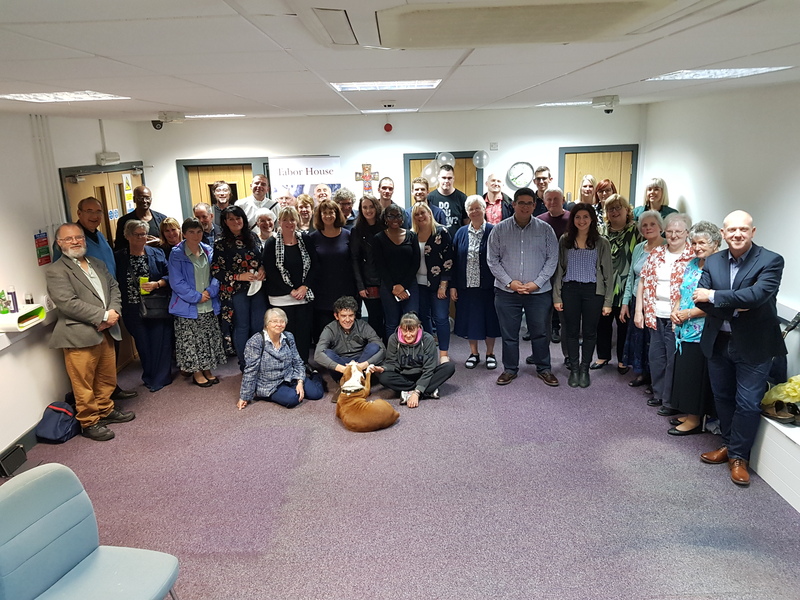 On the evening of Friday 28 September 2018, volunteers, guests, staff and stakeholders (and a dog called Poppy!) came together in Digbeth, Birmingham, to celebrate the first anniversary of Tabor House. Tabor House is the first permanent night shelter in Birmingham catering for people who need a safe space to get their lives back on track. In the short time that Tabor House has been open, it has welcomed over 30 guests, many of whom were rough sleeping before they came to the project. With the support of mentors and volunteers, many have since gained employment and their own accommodation. Tabor is blessed to have corporate sponsors who are very supportive, and this has led to the opportunity of work for many guests. The anniversary event was a wonderful space to say a big ‘thank you’ to them. Around 40 volunteers came to the celebration, taking the opportunity to meet other volunteers and talk about their experiences. Before the cake was cut, board member Ben Rafiqi thanked everyone for their commitment to Tabor and told stories about his time at Tabor from its conception. He spoke of the dedication of volunteers, giving the example that, even during the harsh winter of 2017-18, Tabor House remained open. Ben also took the opportunity to introduce the new staff team – Sharon Fear, the new project manager, Sharon McCall, the new volunteer co-ordinator, and Herman Norford, the new coach co-ordinator. One guest gave a moving and emotional speech, thanking all the staff and volunteers and calling them his family. An important part of the evening was ensuring the guests at Tabor also had a good time and joined in with the merriment. The party ended at 8:30 so that beds could be made and guest could have their space back to relax. The volunteers, staff and guests then cleared up, getting everything ready for a ‘normal’ evening. Those present were encouraged to give feedback on their thoughts of Tabor House. The evening concluded with a prayer from the Vicar General, Monsignor Tim Menezes. The project is being managed by the iShelter Management Committee, made up of representatives from the key partner organisations, under the umbrella of Father Hudson’s Care (charity no. 512992). For further information on Tabor House, contact Christy Acton, Deputy Community Projects Manager at Father Hudson’s Care, on 01675 434064 or 07464 928691. This entry was posted in Birmingham, Homelessness, Tabor House and tagged Birmingham, homelessness, Tabor House by Caritas. Bookmark the permalink.